Maybe some of you do like cycling and watching the Tour de France. I found a live tracker that displays every stage of the tour de france. Shown on the map are of course start and end of the current stage as well as information about mountain and sprint stations along the way. If you are by chance collecting email addresses or keen on recieving a free @msn.com email you might want to take a look at the following page. You are normally not able to get a msn email unless you purchase their internet service. Click in msn email for free to visit the website where you can signup for one. If you think that your IDE hard drives are slow you might want to check their transfer mode by going into Control Panel > System > Hardware > Device Manager. Click on IDE ATA / ATAPI Controllers and right click the primary ide channel (and secondary ide channel if you have hard drives there too) and select properties from the menu. Select advanced setttings from the tab and check the setting under current transfer mode. If you see Pio or a low Ultra DMA mode you might want to try the following fix to increase the speed of your drive(s). The multimedia player Bsplayer has been released as version 2.0 today. I was using previous versions of bsplayer and was really satisfied with it. It had some minor problems and I made the switch to VLC media player and plan on using that one even though the new version of bsplayer has been released. Funny. I made the switch from BitComet to uTorrent two days ago and was using the first release candidate of uTorrent 1.6 with great pleasure. It´s faster and uses less system ressources than Bitcomet. I´ve been using the Stumble Upon firefox extension for some time now and must say that I´am very pleased with the extensions progression. After installation it can be activated by either hitting CTRL + F11 or using the View / Toolbars Menu. You also have to create an account at their website and select some categories that you like, e.g. shareware, windows and bizarre. You just signed up for this cool forum where everyone is having a great signature and you desperately need one as well. My advice would be to visit the coolsig website and take a look at their signature archive. Categories include People and Society, Oddballs, Humor and Geeky Signatures. 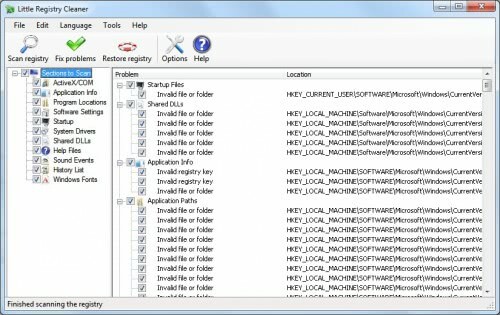 Every passing day makes it more likely that the registry file contains obsolete entries that might make your system unstable. They could also slow down your system. It is a good idea to check obsolete entries in your registry from time to time and remove them to keep the unnecessary entries to a minimum. The question that always comes up when I´am talking about the benefits of download managers is why would someone need to use them at all. This can´t be answered in a hurry but my initial response is always the same. First, download managers are great time safers if you download many files from a server that allows only a few connections from the same IP. It´s tiresome to wait until one download is finished to start the next. This extension is a great time safer. Whenever I wanted to upload an image to add into my article I had to fire up an external ftp client and use it to upload the image to my ftp space. This extension adds a full features ftp client to firefox, this means you can add an unlimited number of ftp hosts, transfer / delete / rename files, set passive mode and much more. This message pop ups at the end and immediatly gets the focus, even if you are in a game or watching a fullscreen movie. You have the option to restart now or later. The first would result in an immediate reboot while the second would nag you again in 10 minutes. This will be annoying if you can´t reboot your computer at that time. What is running on my system? What´s running 2.2. gives you an insight look into what is running on your system. It is completly free to use for non commercial usage and includes information about processes, services, modules, connections, drivers, startup and system. You can control everything with what´s running, e.g. start and stop services and processes.